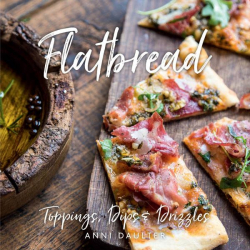 byte.to Flatbread Toppings Dips and Drizzles - Filme, Spiele, Musik, Bücher und mehr kostenlos downloaden. Anni Daulter, "Flatbread: Toppings, Dips, and Drizzles"
Anni Daulters Flatbread: Toppings, Dips, and Drizzles takes a fresh approach to serving these staples with a collection of recipes, including various types of flatbreads, that tempt the taste buds with dips, drizzles, and creative toppings to make appetizers, main courses, and desserts. Artichoke and Truffle Dip, Tamarind Chutney, Fiery Balsamic Glaze, and Calendula Infused Truffle Oil are just some of the dips and drizzles that enhance topping recipes like Good Morning Sunshine, Edens Delight, Honeyed Marrakech Lamb, Mexican Street Fair, Cherry Love, and Blueberry Sunrise. If bread truly is the staff of life, these recipes will make life worth living. Anni Daulter is a professional cook, food stylist, and author. She founded the baby food company Bohemian Baby and the magazine and website Sacred Pregnancy. She has styled food for several books including, Meringue, Caramel, The French Cook, and Mashed, as well as authored Bites on a Board, The Organic Family Cookbook, Ice Pop Joy, Sacred Pregnancy, and others.